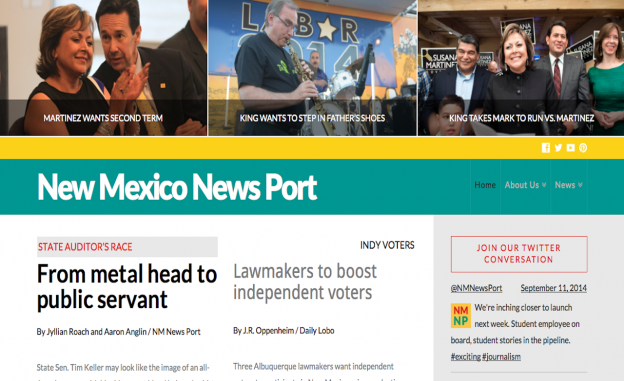 This semester, the New Mexico News Port website will host student content about statewide elections. Co-authored by Michael V. Marcotte. Like many professors across the country, we’ve spent the last few weeks putting the finishing touches on our journalism syllabi, thinking of new ways to reach students and of novel approaches for our assignments. "When we call the lab an experiment, we don't mean playing around with whether we cover the news accurately or ethically. We mean trying out new technology, new workflows and new partnerships." This semester, we have another exciting job. Thanks to a grant from the Online News Association, we’re getting ready to launch a project that connects students in the Communication and Journalism Department at the University of New Mexico to news professionals around the state. In short, we’ve set up a new journalism lab to bring together students from different tracks in the department to work on a web-based reporting project called the New Mexico News Port. The “Port” will be a physical room at UNM for students to write, edit and publish stories, videos and photos. But it’s also a broader experiment about how journalism students can find new ways to turn homework into published work. As part of the project, journalism partners across the largely rural state will have the opportunity to publish student work that otherwise might only see the inside of a professor’s briefcase. That connection to the outlying areas of New Mexico could lead to more students being hired to fill the ranks of the state’s newspapers and television and radio stations. At the same time, we’re building a core group of collaborators right here on campus. These include the independent student newspaper and our local public radio and television stations. Not only can our partners cherry-pick student work, but the News Port can aggregate and help distribute the journalism of the professionals to increase reach and engagement with new audiences. 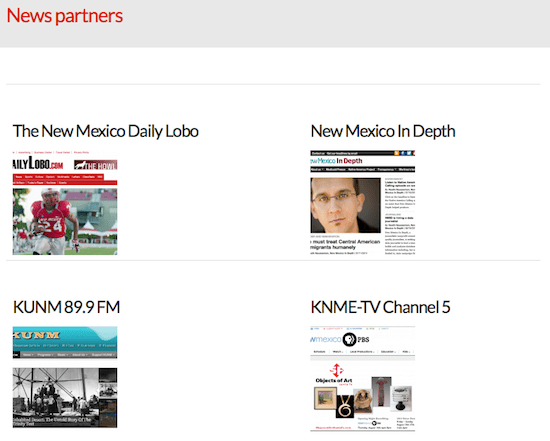 The New Mexico News Port is working with news partners to share coverage. Partners can use student work in their publications and the News Port also will publish work from partners. Despite its vestiges of a traditional newsroom, the Port is a new approach to content creation and sharing. Students will know this is an experiment for UNM and for New Mexico. Partners, too, will be on board with the fact that never before have so many local journalism students contributed to such a project. First up for the Port is covering a gubernatorial election. During the fall semester, we’ll focus our reporting on federal and state elections in New Mexico, including the contest for governor (where Republican Gov. Susana Martinez hopes to win a second term and perhaps set the stage for national office). Although our editor spent almost 15 years covering politics as a newspaper reporter, the students likely will teach us several valuable lessons this November on coordinating and taming such a large election night reporting mob. Leading up to the election, students in the classes that are wired to the lab will research, plan and pitch stories before they start reporting. We expect written and multimedia profiles, campaign finance pieces and features on the people, money and topics fueling the election. As they learn reporting, editing and publishing skills, students also learn how to be a part of the large team coverage. Their stories and packages will get professional editing in the lab — and beyond, as outlets around the state incorporate student content into their publications and broadcasts. Along the way, we’ll talk about the role of the press and how student work can be an important contribution to the state’s shrinking coverage of state government (as newspapers here have closed and the Associated Press has scaled back its presence). With the News Port, students will play a part in watchdogging government, as they will have a prominent place for their work to be seen. It’s a process that turns their classroom into a newsroom in a way that hasn’t been done here before. As the semesters progress, we hope that news partners begin to commission specific stories from students to boost their own coverage of issues in New Mexico. That said, giving the students the awesome responsibility of covering elections comes with some challenges on our end, including getting the students familiar enough with the ins and outs of elections, campaign finance and the democratic process to be able to write about them in analytical and succinct ways. UNM students Tanya Prather, Derrick Toledo and Rachael Rivera edit a story in an advanced multimedia journalism class. The students will submit the story to the New Mexico News Port, which makes it available to professional partners. Photo by Mike Marcotte. Other challenges include pulling in many partners from across the state and across different fields on campus to keep the project going. We think the challenges are surmountable, as students are eager to learn and get exposure, and news partners are anxious to add content to their sites and pages while keeping already tight budgets as lean as possible. To be clear, when we call the lab an experiment, we don’t mean playing around with whether we cover the news accurately or ethically. We mean trying out new technology, new workflows and new partnerships. We mean figuring out the best approach to send hordes of students out on election night and the most sensical way to sort through and publish so much information on deadline. We’ll look at the best way to provide rich content that enlightens readers. We’ll consider the best ways for students to serve the community in ways that seasoned journalists already do. Along the way, we’ll learn about teaching journalism and communication students what they will be expected to do in their new careers. We know students can be successful at covering elections and state government. A July 2014 Pew study found that 14 percent of statehouse reporters in the United States are students — a figure that means new reporters can and do contribute meaningful content for their communities. But will the lab be doing enough by teaching students to simply cover an election and produce a story or multimedia piece for a website, or can we experiment with more? What about the other parts that go into storytelling and digital publishing, such as making charts or using data or mobile devices? What about learning how to use WordPress as a content management system? And how can we incorporate social media into all of this? We hope to address some those issues and that our fellow faculty will embrace the News Port not only for its “teaching hospital model” approach to education, but as a vehicle for research and advancement of knowledge. The News Port can enrich students’ journalism experience by offering theory and training that aren’t yet part of many of our syllabi. Some of that training will come through lectures or instructional videos connected to the News Port, but much of it will come as students experiment in a real world setting. As we continue to plan for the launch, we’re grateful to the ONA and its funders (The Excellence and Ethics in Journalism Foundation, the Robert R. McCormick Foundation, the John S. and James L. Knight Foundation, the Democracy Fund, and the Rita Allen Foundation) for giving our students and faculty the opportunity to try something new — and to learn, teach and experiment along the way. We know the readers of the New Mexico News Port will be grateful as well. Follow the News Port on Twitter. Kate Nash Cunningham is the News Port’s editor. She spent almost 15 years as a newspaper reporter in New Mexico. She teaches at UNM and works as the writing coach for the independent newspaper on campus. She has a master’s degree in digital journalism and design from the University of South Florida and is interested in the intersection of journalism and technology. Follow her on Twitter. Michael V. Marcotte is the project coordinator. He joined the UNM journalism faculty as a professor of practice in 2014, after an extensive career in public media news, management and consulting. He is the 2012-2013 Reynolds Chair in Ethics of Entrepreneurial and Innovative Journalism at the University of Nevada, Reno, and a 2011 Stanford Knight Fellow.